Lakes have always been a source of awe and mystery for human beings. Their formation can be just as amazing and mysterious. The definition of a lake is any body of water that is not an ocean, that is of reasonable size, and that impounds water with little or no horizontal movement. There are a great variety of lake sizes and types. On one hand, you have pools that are slightly larger than ponds. The line between a pond and a lake is hazy and subjective. Where I come from, the body of water that Thoreau called Walden Pond would definitely be called a lake. On the other hand, you have giant lakes such as Lake Superior which contains enough water to submerge all of North and South America under a foot of water. 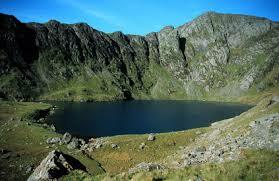 All lakes, large or small, are part of the diverse ecosystem known as a lentic (Latin for sluggish) habitat. Probably even Thoreau didn’t know that. Much of what causes lake formation is due to the work of glaciers. Glacial activity caused the creation of most of the natural lakes in the world. The process of glaciers scraping over time creates depressions that hold surface water, forming lakes. In mountain regions a cirque lake can form if glacial debris block the upper reaches of a mountain valley and then fill with water. Cirque lakes (from the French word for circus, named because of their concave amphitheater shape) are common to many mountain ranges in the United States and Canada including most ranges of Colorado, Wyoming, Montana, Alberta, and British Columbia. While glacial activity is responsible for many lakes, lakes form in dry climates due to changes in precipitation during seasonal climate changes. Pluvial lakes are formed in this manner. These lakes, however, have long since disappeared through evaporation. They are also referred to as paleolakes. In addition to climate changes and glaciers, some lakes were formed by extraterrestrial forces. Almost eerie in its perfection, Lake Chubb (now called the Pingualuk lake) in Quebec is a perfectly shaped circle that occupies a meteorite crater that is 1.4 billion years old. 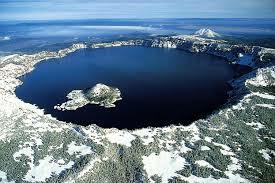 At 876 feet (267 meters) deep it is one of the deepest lakes in North America. It is also one of the most transparent lakes in the world with objects used to measure water transparency visible more than 115 feet (35 meters) deep. There is a similar meteor crater near Flagstaff Arizona formed about 50,000 years ago that contained a much smaller, but similarly shaped pluvial lake. While these two lakes were created by forces out of this world, Kettle lakes are created by what lies beneath the earth’s surface. They are depressions formed by stranded blocks of buried glacial ice that slowly melted during the Pleistocene epoch. As they melted the land surface above them collapsed and created a hole. 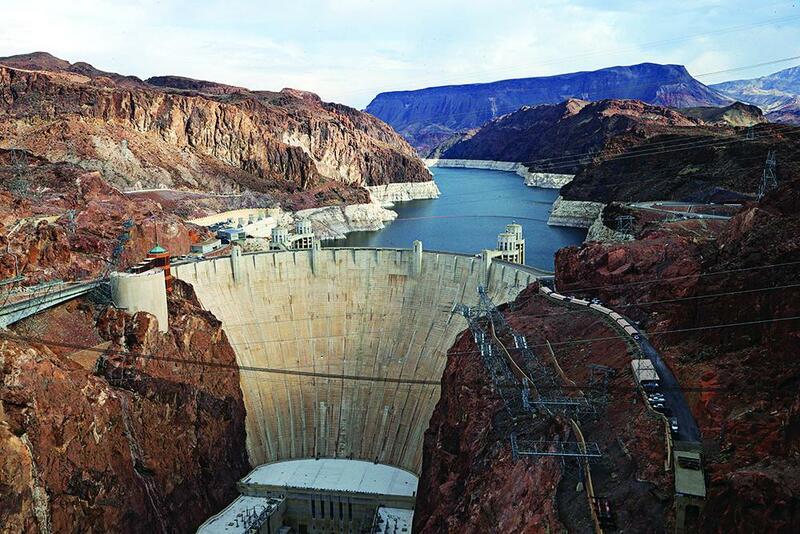 If the collapse created a hole large enough to reach groundwater, a lake was formed. Kettle lakes are found generally in Ohio, Minnesota, North Dakota, Wisconsin, Michigan, Alaska, Colorado, Idaho, Pennsylvania, British Columbia, Manitoba, Ontario, Saskatchewan, Quebec, and central and northern Europe. Most lakes in Michigan, in fact, could be described as kettle lakes. The age of a lake can have a great impact on its characteristics. Lakes can be young, middle-aged, or old. 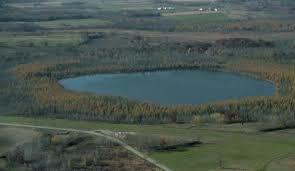 Young lakes are known as oligotrophic lakes, and have bottoms that are very clean and lacking in organic material. A clean lake may sound pristine, but lacking this material means the lake also lacks a sufficient food source to provide appropriate habitat to produce plants and freshwater organisms. Over time, however, earthen particles and other organic materials from decaying plants and animals can build layers of materials making the lake a suitable home for plants and animals. Middle aged lakes that have allowed for aquatic growth are referred to as mesotrophic lakes. When a lake ages, the amount of organic material and mineral deposits may become excessive and actually inhibit or stop the growth of aquatic plants and animals. An old lake of this type is called an eutrophic lake and is typically filled with an excess of organic and mineral materials. In addition to all the naturally formed lake varieties, humans have formed many lakes as well. 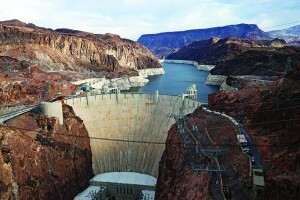 A reservoir is a human-made feature created by construction of a dam or dike. These man-made lakes are created for a variety of reasons including hydroelectricity, direct water supply, and of course, recreation. Salty or fresh lakes are some of the only freely available water sources on land. Mysterious and majestic, they are an important part of human and animal life. Reference: Thomas V. Cech, Principles of Water Resources and the Wikipedia.